In the first part of this series, we discussed CEVA Pallecon 's commitment to sustainable development, an important consideration for any business working in the packaging industry, as well as looking at the company's rental options, and the advantages this service provides for customers. Here, we will discuss two bulk handling solutions offered by the company, the first intended for transporting fresh food, and the second designed for liquids. CEVA Pallecon's range of Returnable Plastic Containers (RPCs) was designed in response to a rising demand by vegetable growers for an easy to fold down, safe and efficient packaging solution for fresh food. These RPCs are available through one of the company's rental options, making them an affordable option for growers looking to utilise them as seasonal requirements demand. 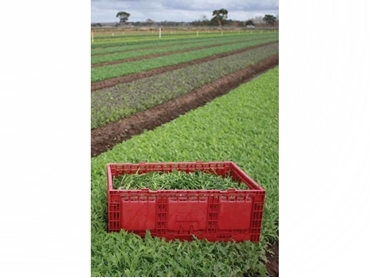 Made from 100 per cent recyclable food grade polymer, they are fully compatible with Australian Standard pallets, and feature smooth inner walls for product protection and pack efficiency. In addition, the lightweight design combined with the fold down ability of the RPCs allows for cross and column stacking, which provides improved load stability when transporting product, and an empty return ratio capacity of 6:1. A comprehensive range of demountable liquid intermediate bulk handling solutions is available from CEVA Pallecon, all of which are designed to simplify the storage and handling of raw materials, ingredients and work in progress. In particular, the company's M3 liquid Intermediate Bulk Container (IBC) is manufactured from food grade, recyclable HDPE panels with galvanised steel base and frame, and features a patented split lid design that slides back and locks into place eliminating the need to manually remove the lid. Graduated sight glass provides a clear view of the level and quality of products being transported, and a plug in heater baseboard is available for improved discharge of viscous and difficult to handle products. Alternatively, CEVA Pallecon's M2 IBC is described as a premium solution for liquid transportation, offering a large 1000 litre capacity. These IBCs are an ideal alternative to 205 litre drums, delivering a 25% saving in storage and handling when compared to the latter. They feature an adjustable discharge outlet collar lock, and a 3:1 fold down ratio for further transport and space cost savings. In the third part of this series, we will discuss CEVA's plastic folding bulk storage bins, which are available in vented and unvented models, for automotive and general use, and food and general products respectively. We will also look at the company's reusable bulk handling solution for the transportation of hazardous goods.